Do students have to be Catholic? 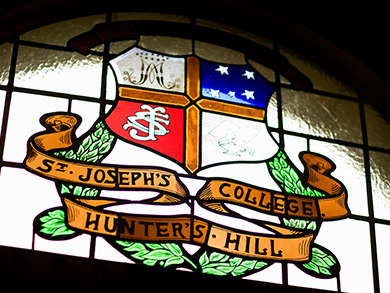 Students do not have to be Catholic to attend St Joseph’s however they and their family must demonstrate a willingness to fully support and participate in the faith and spiritual life of the College. All students are placed on a waiting list until the enrolment process begins. Applications for Year 7 day and boarding students are processed two years before the intake. Applications for boarding students for Years 8 to 11 is processed one year ahead. When does the College accept enrolments for day boys? Day boy enrolments are accepted for students in all year groups. What are normal school hours for a day student? Normal school hours for a day student are from 8:00am to 5:00pm or approximately 8:00pm. These times allow day boys to bond closely with boarding students and take part in a diverse range of College activities. Students leaving at 8:00pm have dinner, showers and supervised study time at the College and this is all included in the day student tuition fee. No. St Joseph’s College is a non-selective school so there is no entrance exam. In 2014 there are 1086 students enrolled at St Joseph’s. How many students come from rural/regional Australia? Approximately 23 per cent of boarders come from rural/regional Australia. Is there a peer support program? Year 7 students participate in a buddy program with Year 11 students. This program is just one element of the College’s comprehensive, family-centred pastoral care. The pastoral care network includes a full time Chaplain, counsellor and Year Coordinators who are overseen by the Director of Students and the Head of Boarding. Do boarders get their own bedroom? Boarders in Year 12 have their own bedroom/study which is furnished with a bed, desk, chair, cupboard and shelving. In 2009 the Year 12 boarding area was completely refurbished, with new bedrooms, bathrooms, carpet, underfloor heating and day student study areas. Boarders in Years 7 to 11 live in shared dormitories and each boy is allocated his own area comprising a bed and a locker. Each day student also has a locker (‘press’) in the boarding areas. At the beginning of 2014 the junior boarding areas were completely refurbished. Where can boarders watch TV at the College? Each boarding area has TV (including Foxtel) and DVD players for use by the boys during evening recreation or weekends in specified times. Where can boys access the internet at the College? The College provides high speed, wireless internet access in all areas, including boarding, facilitating ‘anywhere, anytime’ learning. The College monitors internet use to ensure activites are safe and boys behave responsibly online. Do all students have a laptop computer? Yes. In 2011 the College embarked on its 1:1 Learning Program, in which every student has his own laptop computer. For more information on the 1:1 Learning Program click here. How much homework do boys do? Students complete from 120 minutes of night study per evening (Years 7 and 8) up to 180 minutes per evening (Year 12). There is also a time for weekend study. All study periods are fully supervised. Do boarders have free time? Regular weekend recreation activities and outings are organised for boarders. Can families visit during term time? Families are welcome to visit to share lunch during the week, participate in Masses and events and take their sons out on free weekends and special occasions. Do boys have to play sport? Participation in co-curricular activities and sport is compulsory. There is a wide range of co-curricular activities on offer (e.g. music, debating, public speaking, chess) and students select a winter and a summer sport. The College participates in AAGPS sporting fixtures. The College has an on-site shop which sells apparel, stationery, basic items such as soap and toothpaste and Joeys memorabilia. Does the College have a bus service for day boys and weekly boarders? A daily SJC bus operates from the Northern Beaches and Eastern Suburbs morning and afternoon. A Sutherland Shire service picks up weekly boarders on Monday mornings. The College is also serviced by regular public transport routes. How do boarding students travel home for school holidays? Transport by bus and train (TrainLink) is arranged for students from regional and rural areas for holiday periods. How can families become involved? Families are encouraged to play an active role in College life. Opportunities for involvement include the P&F and its affiliated committees, SJC Foundation, craft@joeys, Friends of Joeys Music, Friends of Joeys Drama, sport, Resources Centre, Finance Advisory Committee and events such as the annual Spring Fair. Families are also encouraged to attend Family Masses held at the beginning of each term. How can I apply for a job at Joeys? Employment opportunities are advertised on the College website here and in major newspapers throughout the year. There are opportunities for teaching and non-teaching staff.